What is the purpose of a dog? The story block is unreadable; the print is too small…enlarging actually makes it worse. Perhaps it’s the white on black background. Your list is excellent. I no longer have dogs, I switched to cats. I do hope to again have a dog, or two, but the living situation has to be optimal, which means NOT in a city. Thanks for the note about the little boy’s observation about dogs and life – that was the best! Ditto for cats…. Here you go, all you dog lovers… one purpose of a dog is to have FUN! Well, after reading the profound words of a six-year old boy after the death of his dog, we know now why God made six-year olds. To keep the adults in line and to teach us older folks the true meaning of life. Tears are rolling down my face – what a great fealing. Thank God for six-year olds! Wow. Little Shane got it bang on! Thanks for sharing this story Doc. Wonderful list of purposes for a dog. Too short though: there are many more. As for dealing with death, that will never happen. I have lost several dear dogs in my long lifetime. I can’t and won’t “get over” any of them, and only hope they will sit, stay, wait for me. 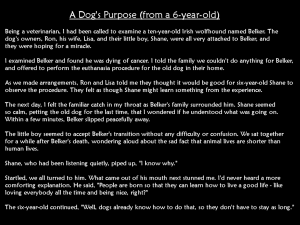 Thank God for wonderful dogs like Belker…it was obvious he was loved…and kudos to 6-yr old Shane for understanding what most adults can’t. I too had tears rolling down my cheeks! Thanks for sharing. I agree with Judi, it totally brought tears to my eyes. I agree Dogs love unconditionally and are our true friends! No truer words were ever spoken than that of the little 6 year old boy. We can learn so much from animals if we only take the time to listen & watch. Love them dearly while you have them as after they are gone you only have memories- may sure you will have good ones. That’s all you have to hold on to. Wow, that is some amazing wisdom from a young person. Simple truths and wisdom often come from the young. It sounds like his parents taught him well also. Thanks for sharing this sweet story. Anyone who has trouble reading the small print…. just click on it and it will be readable and clear. Right click and open in new tab/window and it will be enlarged. I believe the dog/wolf taught early humans that other creatures had the capacity to love, or basically had a soul. 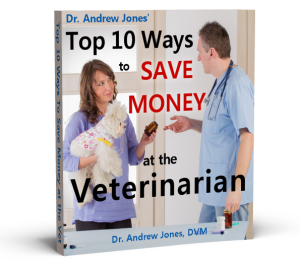 We are here to learn many lessons and our pets are here to teach us some of those lessons. Basically they teach us how to be better humanbeings or in some cases how much we need to still learn! 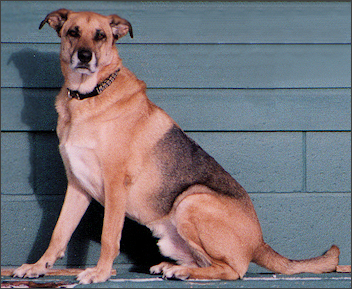 Being a veterinarian, I had been called to examine a ten-year old Irish Wolfhound named Belker. The dog’s owners, Ron, his wife, Lisa, and their little boy, Shane, were all very attached to Belker, and they were hoping for a miracle. The next day, I felt the familiar catch in my throat as Belker’s family surrounded him. Shane seemed so calm, petting the old dog for the last time, that I wondered if he understood what was going on. 4) Patience, Sweetness of Spirit, and so much more. 6) How in loving another you are in fact loving yourself and your Creator. 7) How absolutely MARVELOUS God is. No wonder He proclaimed, “The BEASTS of the Field are MINE.” Man is only given DOMINION (the ability and response-ability to care for, protect and enjoy)our animal kingdom. They do NOT belong to us. What is the price of five sparrows–two copper coins? Yet God does not forget a single one of them. And the very hairs on your head are all numbered. So don’t be afraid; you are more valuable to God than a whole flock of sparrows. That really touched me. God is not only the great Physician, but the great Veterinarian as one day all these little ones will be enjoying eternity as they were originally designed to do so. Thanks for that great post, Annette! And I know my little doxie was given to me to love and to care for…he brings me such joy to see his jaunty little self, to laugh when he does something funny, he cheers me up, he is there to just calmly be with me when there are tears, and he often tries to lick them away, to snuggle with under a blanket when it’s chilly, to enjoy the outdoors when it’s nice out…he is also good to sit in the lamp of an elderly friend and comfort her and also to make her laugh. God created him and gave him to me because He knew my little dog would bring me joy and delight every day. Forthe person who said the print is too small just click on it a couple of times. 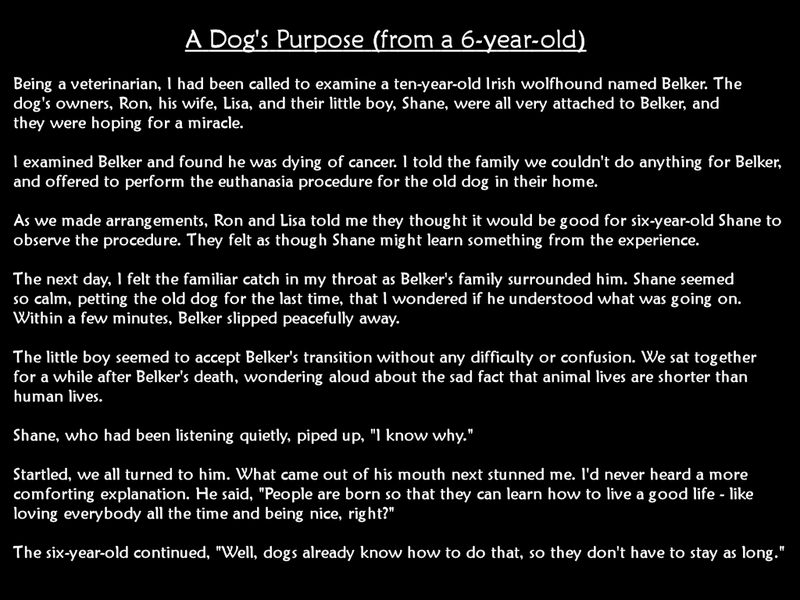 A child’s crystal clear mind speaks such truth about a dog’s life. very touching. That was very touching and Heartfelt! My mom gave me that story when I lost my 15 year old German Shorthaired Pointer named Coco from Cancer. It certainly helped me (although I still miss her) that was 4 years ago. 1 year later (almost to the day of loosing Coco) I lost a 14 week old German Shorthaired Pointer puppy named Mocha (and yes, I miss her too). That short story helped me again and I now have a wonderful 4 year old German Shorthaired Pointer named Piper who is healthy, energetic and full of vim and viger! I have since passed that story on to other friends who have lost their dogs to cancer and they all agree, it is beautiful and that it has helped them as well. Dogs feed your soul. They know what you need and give. I get rescue dogs they have so much love. Keeps the BP down. Congratulations, this is a beautifully written article and I have passed the same to many of my friends who love pet dog as a companion. Really touching and worth remembering. I was very touched by the story. All animals are wonderful creatures, but dogs are even more so. I´m sure God created dogs to keep us company and love us unconditionally, and most of all, to teach us how to be better human beings. Hello Dr Andrew, I enjoyed reading your comments but the story and kid’s was too poignant. I hate pain and fear and try to avoid them. Humans in general with the exclusion of yourself think they are superior to animals,think they have more appreciation of certain meats: I have yet to see a human licking their lips for 20 minutes after consuming a meal!! So I share my best bacon on Saturday morning and when I do eat meat my beloved whippet shares that with me too. I have never loved any being as much…. anyone that declaws a cat, does not deserve to have one, it’s cruel and barbaric,they have rubber nail tips for them. hey after you have your cat declawed. COME TO MY HOUSE SO I CAN DENAIL/CLAW YOU!!!!!!!!!!!!!!!!!!!!! So very sweet…..this child understood better then alot of adults. Kind of how I feel about all my dogs…..and my current dobe, Dillon…..doesn’t yet have the title “Companion Dog” CD after his name yet……BUT he is everything that “companion dog” stands for. Re declawing cats…..I absolutely hate this! It seems once people declaw their cats….they let them outdoors…….are they so stupid to realize that w/o claws these cats have no protection???? I have 2 indoor cats..and I wouldnt EVER dream of declawing…….people are so lazy…..it’s simple to just wrap cat in a towel, and use either toenail scissors or a small clipper. I believe it’s the fact that, as usual, people are getting lazier! Love the purpose of a dog!! and of course its a family member!! like how u said that in one of your articles. great emails!! keep up the great work!!!! I suffer from Major Depression and live alone. I have developed a bit of agoraphobia, making it super hard or sometimes impossible to get out and go somewhere. Was diagnosed with an Anxiety Disorder (GAD) also. The best thing I’ve ever done was adopted my little chihuahua from the Humane Society. Pedro was overlooked by adoptees because he had mange, flea allergy and his tail can’t wag because of a birth defect. No one wanted this little ugly dog. The Humane Society reduced the fee to adopt him to try to get rid of him. My heart felt total love for this poor little dog. I fell in love with him before I ever saw him in person. I found him online at Petfinders.com. I adopted him after driving almost 3 hours to get him. I treated the problems he had. I saved him, but he also saved me from this horrible depression and loneliness! We saved each other from horrible afflictions! He is the VERY BEST pet I have ever owned. He is so smart, sometimes I think he tries to answer me…haha. He understands so much that I say. I put in his own little doggie door that opens to my large, fenced-in back yard. He now has a life of luxory. My depression lifted dramatically because of his love and loyalty to me. He follows behind me every time I get up and walk around. He is something else…haha. Please adopt a pet to help with the over-population in our country! Have them spayed or neutured to stop this major problem that we have! I too have saved our dog and he has come to us all the way from Romania to save and support us. He is the 10th rescue dog in my life so far (not all 10 at the same time! 9 beloved friends have passed over the rainbow bridge. We named our rescue dog Astro as he comes from “above” with a purpose. He is an amazing dog who spent years roaming the streets after being kicked out by his “protectors” when they no longer had resources to care for him. A more grateful, loving and trusting dog would be difficult to find after being a victim of so much cruelty. He is so friendly,loves to learn new things and so obedient,but likes to play tricks on us; as if to remind us that life should be a fun game! We have been together for 6 wonderful months so far. Finally, he gets so excited when I add “Dr Jones supplement” to his homemade food. He says “I´m lovin´it!” and my Mum has fixed my paws and got my tooth filled so life is pretty good right now and by the way I have lost weight too so I can play games and go for long walks with my Mum and Dad. Yes, dogs certainly know how to love and teach love and kindness under all circumstances!